OMEGA™ Self-Sealing Plugs will allow you to take pressure and temperature readings quickly and eliminate the need for leaving costly gauges or temperature indicators on the line. The OMEGA™ plug is permanently installed in the line at recommended test points. 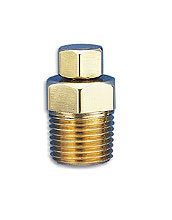 The cap protects the valve and provides an additional positive seal. After the cap has been removed, either a test thermometer or a gauge adaptor with the proper pressure gauge attached can be inserted through the two self-closing valves in the plug. Readings are taken, adjustments or tests can be made, and when the probes are withdrawn, the two valves close. The protective cap is then reinstalled. Neoprene is resistant to deterioration from waxes, oils, greases, fats, petroleum products, and most refrigerants. Can be operated at a maximum temperature of 200°F (94°C) at 500 psig. Nordel gives excellent service in hot or cold water and in some applications of low pressure steam. Nordel is resistant to detergents, phosphates, esters, ketones, alcohols, and glycols. It is not suitable for petroleum products. Can be operated at a maximum temperature of 275°F (136°C) at 500 psig. For complete product specifications see the detailed data sheet in the related section below.